Connect with strong, inspiring women in your community. If you'd like to read more about what we accomplished in 2018, read our Annual Report! Attend one of our many events, like our regular “Women on Topic” event or Women’s Equality Day gathering, to make connections that matter and meet other proud feminists, with the help of the Wisconsin Women’s Network! Nearly a century after gaining the right to vote, women continue to experience voter inequalities due to disenfranchisement, barriers to access to the polls, and restrictive voter ID laws. The Wisconsin Women’s Network recognizes Women’s Equality Day, observed every year on August 26th, in order to bring awareness to the inequalities (at the polls and beyond) that so many women experience because of their gender, race, ethnicity, age, religion, sexuality, ability, identity, and socioeconomic status. Our Women's Equality Day event serves as a fundraiser to sustain the Wisconsin Women’s Network and our work to advance the status of women and girls in Wisconsin. We hope you will join us to hear from inspiring women from across our great state! Join our email list and like us on Facebook to get up to date announcements about this year’s Women’s Equality Day event. The Wisconsin Women’s Network’s “Women on Topic” Brown Bag events regularly offer a timely perspective of women working and leading in a variety of fields that promote the advancement of women and girls in Wisconsin. The series invites experts to discuss relevant issues affecting women and determine how we can work together to improve women’s lives. Past topics include discussions on voter ID laws, International Women’s Day, the impact of the environment on pregnancy, women working in the dairy industry, and human trafficking concerns in Wisconsin. Join our email list and like us on Facebook to get up to date announcements about future Brown Bag events. Our next Women on Topic event is on January 9th at 5pm in the Community Room at Festival Foods. Is your New Year's resolution to start a budget or strengthen your financial know-how? Join the Wisconsin Women's Network as we hear from three certified credit union financial counselors. Ria Sengupta, Cassandra Thom and Jazmynn Appleton, from St. Mary's & Affiliates Credit Union, will cover critical financial and budget planning information. Have an idea for a great Brown Bag discussion topic? Email us. Feminism on Tap is a series of monthly happy hour networking events in Madison, Milwaukee, La Crosse, Kenosha/Racine, Oshkosh, Appleton, and Green Bay. Events are organized by the Wisconsin Women’s Network and our many partner organizations around the state, including Planned Parenthood Advocates of Wisconsin, NARAL-Pro Choice Wisconsin, 9to5 Wisconsin, Zonta Club of Madison, YWCA La Crosse, and the Wisconsin chapter of the National Organization for Women. These fantastic monthly gatherings are a chance for social and gender justice advocates and other community members to network, develop ideas for collaboration, and discuss local efforts to advance the status women and girls in Wisconsin. Check out the Feminism on Tap Facebook page to find an event near you! 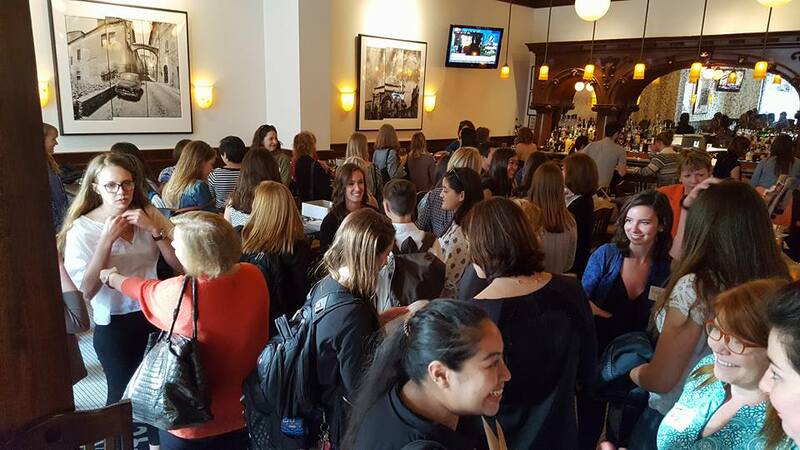 Connect with others in your community who are interested in learning about the issues that women and girls are facing at networking events hosted by the Wisconsin Women’s Network. Events include social gatherings, professional networking opportunities, and the chance to meet the mentors and students involved in the Wisconsin Women’s Network Mentorship program. Join our email list and like us on Facebook to get up to date announcements about future networking events. Artful Women celebrates 32 years of providing a venue for talented women artists to exhibit their work. The juried art show and sale coordinated by fantastic volunteers benefits the Wisconsin Women’s Network. This year's Artful Women show runs from November 3 through December 1, 2018 in the Skylight Gallery (Surgical Waiting Room) at University Hospital, 600 Highland Ave., Madison. Join us for a 'Meet the Artists' reception and awards ceremony on Sunday, November 11 from 1:00 – 3:00 p.m. in the G5/2 Clinics Lobby. The awards ceremony begins at 2:00 p.m. To apply, download our application here. Started in 1987, Artful Women celebrates female artists in Wisconsin. The gallery show and sale, run by creative and dedicated volunteers, serves as a fundraiser for the Wisconsin Women’s Network and continues to be a venue for new and experienced women artists to come together to create an interesting and diverse exhibition. Every year, nearly seventy women artists across the state enter paintings, bead work, photography, sculptures, and mixed media pieces for inclusion in Artful Women. In addition to a month-long exhibition at the UW Hospital and Clinics, Artful Women includes a meet-and-greet reception, held the second Sunday of November, and a "Best in Show" honor awarded by a local artist or art teacher. Applications to enter the Artful Women Show/Sale are due to Kathryn Lederhause at artkhlwwn@gmail.com by October 3rd. Applications can be downloaded here. For more information about how to get involved with Artful Women, please contact Kathryn Lederhause. Thank you to WWN supporter, Kathryn Lederhause, for your leadership on this important program that showcases local women artists.